My starting point for this trail of inspiration not more than 24hours ago lead me onto many winding paths of colour, inspiration and acknowledgement of pure talent. One of the things on my ‘to do’ list was that for this month I would stay focused and blog a post every Saturday on Beverly’s Pink Saturday for the month of October as a reminder of National Breast Cancer Awareness Month. Take a couple of ‘clicks’ backwards, and although I’m not always finding time to post and create, within the solitude of my bedroom of an evening, I visit bogging friends, leave comments and join in the circle of friendship, that I so love to be a part of. So, this is how I made a new connection to ChopinandMysaucepan, where I discovered they were one of ten bloggers from around the world in the Royal Selangor Jellyriffic Competition .How exciting and a lot of hard work! The competition is that each of the ten bloggers post a recipe each day for 30 days in the month of October 2011 to raise awareness and support for breast cancer. Check out some of their creations:Day #15 Biriyani rice with cashew nuts and raisins, Day#11 Green and Gold kiwifruit pavlova, Day#7 Antipasto pyramid with rocket salad. Just amazing…inspirational. Where I found one of my favourite contestants Billy Law from Masterchef Australia 2011, who also was participating in this 30 day challenge.Billy’s Blog A Table For Two features best eats in Sydney and around the world. And oooh you should see some of his great desserts in this challenge. Visit Billy’s blog here. This then led me back to the Pink thing for today’s post…now I’ve mentioned that I’m also a little bit of a pinning diva. It’s also a little ‘out of control’ hip hop up there pinning Queen…diva! See my boards and follow them here at Pinterest. You have been one busy lady. At least, you had time to show off some very nice pinks. What yummy pinkness all the way around, Yvette. Your pink photos say it all down to the pink books and roses. 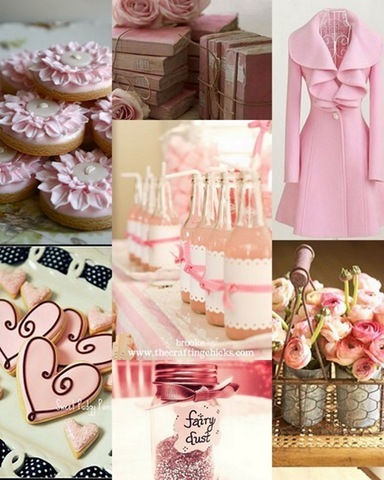 I think my favorite are the pink flower-icing cookies. They look so pretty as well as delicious. Your collages are so beautiful! I am also a pinning diva and have a “pink board” for daydreaming away! I adore that coat! Wonderful gentle pink tones. Beautiful images and a fantastic Mosaic. You have a lovely blog here, so pretty and feminine. I love the pinks you have picked for today. 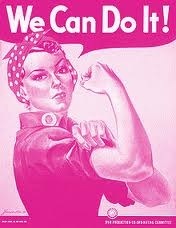 I hope that you have a good week and it is great that you have highlighted October as being Breast cancer aware month. I am going to have a look around your blog now and am looking forward to reading it! I have also posted a pink post to honour a very dear friend of mine who passed away this week from breast cancer.This October’s pink ribbon campaign is now even more important and poignant than ever before. I hope you will come visit. 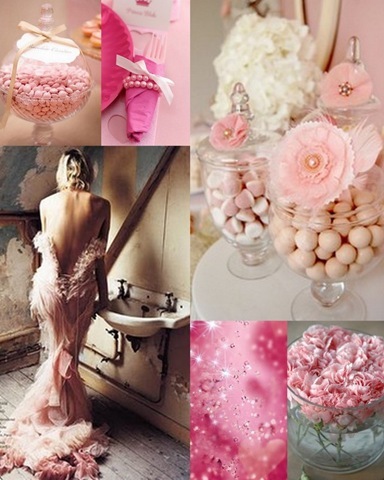 Love all these pink images! Ohhh, That Dress! I’m now following you on Pinterest, and sorry but I had to repin a couple. Couldn’t resist. (I’m pretty new to Pinterest and hadn’t even realised you could have more than 12 photos on a board! Your pix are fabulous and I could look for hours). Great post – you have a really good eye. I couldn’t decide which pic i liked best, roses are my very favourite flower, but that dress is to swoon for. I just came across your blog while looking through the Pink Saturdays (I am a day late due to computer problems) and was so impresses with your beautiful soft pink photos…..the flowers are lovely, the decorated cookies are great, and that DRESS!!!! How I wish I could have worn one like that “in my younger days”!! Simply breath-taking!! I am going now to check out the other blogs you mentioned, but i will be returning each week now that I have “found” you…..gorgeous blog! !